In last month’s column I focused on concert planning and suggested repertoire for bands to consider to celebrate Canada’s sesquicentennial year. What a pleasant surprise to learn of the plans of a few groups which intend to incorporate some of those suggestions into their programs. One of my top preferences in last month’s column was Calixa Lavallée’s La Rose Nuptial (Bridal Rose). So, very encouraging for me was news from the Wychwood Clarinet Choir that they hope to have an arrangement of that work as part of the Canadian celebration in their May concert. Choir members, and skilled arrangers, Roy Greaves and Richard Moore are working on that. This year’s winter concert “Midwinter Sweets” will not be at their usual location, but at Knox United Church in Scarborough, on Sunday, March 5 at 7:30. The program will also feature Concert Piece No. 2 for Two Clarinets by Felix Mendelssohn arranged by Richard Moore and Roy Greaves, Holberg Suite by Edvard Grieg arranged by Greaves, “Tonight” from West Side Story by Leonard Bernstein arranged by Steve Macdonald and No More Blues by Antonio Carlos Jobim, arranged by Macdonald. As usual, artistic director and clarinet soloist Michele Jacot will be at the helm. Kennedy’s musical experience includes appearances on many CBC television music shows and he was the composer of Run Terry Run for the Canadian Cancer Society and In Love with an Island the official song for PEI’s centennial. Now that the work is ready for publication, Fleming has persuaded a local band to rehearse in private and record it for demo purposes. In addition, he has engaged a copywriter, an art director and an online direct marketing expert to develop a program to market these pieces to community concert bands and post-elementary school bands across the country, at his own expense. When the recording is complete the intention is to post excerpts of the music online and invite decision makers from bands and music schools across the country to listen to the music and hear for themselves that it is enjoyable listening and eminently playable by most bands. All conched out! Another sesquicentennial event is the “Canada Celebrates 150” concert by the Navy Band of HMCS York at J. Clarke Richardson C.V.I. in Ajax on March 4. This will feature the York full concert band with a combined Richardson Collegiate and HMCS York jazz set sandwiched in the middle. The program will also have students from the school’s Vimy Ridge trip giving a presentation during the concert about their trip to the Vimy Ridge 100th anniversary commemoration ceremonies. This concert is not only a celebration of Canada 150, but is also a veterans appreciation concert. Admission is free for all veterans. A special treat will be the opening played by the band’s conch group, the only small ensemble from the band in this concert. YES! You read that right. They will be playing on conch shells. Recently I had the pleasure of hearing them in a concert at the Naval Club of Toronto where several small ensembles from the band entertained club members and any members of the community who wished to attend. This small group had its beginning last year when they played a fanfare for the visit of an admiral. The group consists of five different-sized conch shells which produce different pitches when the players move their hands in and out of the open end. Moving the hand in lowers the pitch and moving it out raises the pitch. To make these shells playable the tip has to be cut off and then they are basically played by buzzing into them like a trumpet. This special ensemble of five band members now has a name. They call themselves the Band Shells. The Band Shells are the brainchild of Leading Seaman James Chilton, who is known in civilian life as James Chilton PhD. He is the man who, last year, was featured at the Naval Club event playing the didgeridoo. At this year’s event it was a duet with didgeridoo and tuba. He also performed on an instrument of his own design. It is a sort of “sliding didgeridoo” which is really played more like a trombone. He calls this one a “didjeribone.” Another selection which he played was done with a collection of variously pitched jaw harps and a looping pedal so that he could play them all at once. Then there was the trombone quartet which performed a number of traditional sea songs. In some quarters you might find people who look upon military reserve bands as amateurs. Not so here. In that group, all four trombonists have degrees in music including one doctorate and two master’s degrees. The fourth member is working on a master’s degree. As for a name, members of this trombone quartet haven’t yet decided. Some like to be called the Tromboats and others prefer the Seabones. Plumbing Factory and Northdale: While on the subject of anniversaries and similar celebrations we have just learned, from the indefatigable “Dr. Hank,” Henry Meredith, that the Plumbing Factory Brass Band is planning an evening of “19th Century Brass Band Music” in April. Similarly, The Northdale Concert Band is planning well in advance for a Gala Concert and Banquet to celebrate their 50th anniversary during Canada’s special year. This won’t be until November 4, so we have lots of time to provide full details. As a teaser though, it is safe to say that the concert will feature Vanessa Fralick of the TSO performing two solo pieces on trombone. The band has also commissioned a special work by Gary Kulesha, in honour of their 50th year, to be performed in the same concert. New Horizons: In last month’s column I mentioned that the North York New Horizons Band was being re-established, at Long & McQuade on Steeles Ave. just east of Keele St. We have now learned that the band is up and running under the direction of experienced music teacher Susan Baskin. Their branch of New Horizons is called: New Horizons Music North York, and they rehearse on Monday nights from 6:45 to 8:45 in the Long & McQuade, North York, Lesson Centre, at 2777 Steeles Ave. W. As is the case with all New Horizons bands NHM NY Concert Band welcomes all adult woodwind, brass and percussion players from beginners to advanced. They are especially interested in bass clarinets, saxophones, trombones, baritones/euphoniums and tubas. Remember the New Horizons slogan: “It’s never too late!” Their email is: nhmnorthyork@gmail.com. Kiwanis Music Festival Toronto: It has been many years since I had any direct connection to the kind of music festival that was a part of my life while playing in boys’ bands many long years ago. It was time to see what they are like today. Where better to start than with the community bands? Unfortunately, the Columbus Concert Band and the Newmarket Citizens Band were the only two entries this year; still, that was better than last year when there were no community band entries. On the other hand, there were 150 school bands entered in that class. The Wind Symphony of Cardinal Carter Academy took top honours with a Platinum award of 96 percent. I dropped in on the performance of the Newmarket Citizens Band and had an opportunity to chat with the festival artistic director Giles Bryant and adjudicators Dennis Beck and Michel Fortin. After the band’s performance the adjudicators provided many constructive comments and each conducted sections of the music to suggest possible options for improvement. It was a very worthwhile evening, even for a spectator. And speaking of concert bands, the Markham Concert Band will present their Symphonic Pops Favourites Sunday, March 5, at 2pm at the Flato Markham Theatre with a potpourri of familiar tunes. 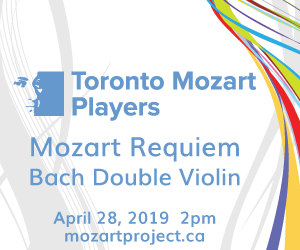 A special treat: the band will be joined by pianist Ellen Meyer in a performance of Mozart’s Piano Concerto No.21 with the full band accompanying. Gilbert and Sullivan again: This has nothing to do with bands or band music, but once in a while I choose to digress a bit. For me, attending the annual Gilbert and Sullivan production by Saint Anne’s Music and Drama Society has been a longtime tradition. G&S has been in my blood since I was born. My parents met in a G&S production where my mother was “poor Little Buttercup.” For many years I played in the pit orchestra at Saint Anne’s. When I started, Roy Schatz was one of the leading figures in the production. His daughter Laura Schatz was a little toddler who had chances to walk across the stage. Some years later, as Laura grew up, she had singing parts. Fast forward to this year’s production of The Grand Duke. Roy was the Prince of Monte Carlo and Laura was the artistic director and the Baroness Von Krakenfeldt. To complete the cast Laura Schatz’s two teenaged children also sang in the production. What a family tradition with three generations on stage! Jack MacQuarrie plays several brass instruments and has performed in many community ensembles. He can be contacted at bandstand@thewholenote.com.